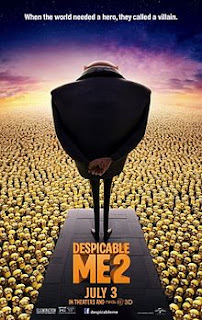 Having watched Despicable me before, i expected the same fun and cute stuffs in the moive. Indeed, the movie did not disappoint with the storyline. I love to see Gru taking great care of the three sweethearts. He even attempted to dressed up as a fairy so that his daughter will be happy in the birthday party. That was indeed endearing when he shown so much care and love for his beloved daughters and that touched my heart. He even goes to the extend of being a protective father over his children, something which i felt so sweet. I like that the story is simple and easy to understand or predict since it is an animation for kids. However, who says adults can't join in the fun? I think the minions were so cute and i even imagined owning them in real life. Gru and lucy were so compatible and hilarious whenever they are together, be it completing a mission or otherwise. I simply like to see cute stuffs and sweet interaction between the couples. Indeed, it took them some time and an obstacle to overcome in order to be together. It reminds us to cherish the person next to us. They have a blissful wedding with the minors singing congratulation songs and the marriage was witnessed by his daughters. Now, there were some scenes which were a little shocking to me. Such as when the minions disappeared suddenly and been stuck into an Ice-cream van! That screams horror and i was wondering what will happen to them? Subsequently, we saw the minions actually enjoyed their life at a mysterious beach. What happen next were beyond imagination as my cute minions were transformed into monsters after they were injected with the serum! They became the children's nightmare out of a sudden and threatened to destroy the world. Gru and his team were left to save the world from the mutated minions. Bring on the actions!